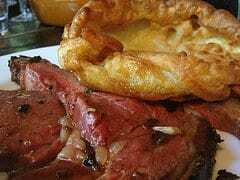 Yorkshire pudding – a famous English dish you can make easily at home. Home » Bread Recipes » Yorkshire pudding – a famous English dish you can make easily at home. In England, as a kid due to food shortage, we were given the choice of having our slice of ‘Yorkie’ on our dinner plate or served as our ‘sweet’ with jam on it. Of course we always choose our Yorkie as a ‘sweet’ else we did not get any dessert! Yorkshire pudding is a perfect side dish to serve with a roast. Temp: 450 F Time: 10 - 15 min. I use a glass pie plate so if you also do, turn the heat down to 425°F. Tip One tasty and cooking trick - save in a mug in the fridge drained off bacon drippings to use in this recipe - also for that super taste in English Roast Potatoes! Now combine well-beaten egg and milk; beat till light. Gradually beat in sifted flour and salt; beat with over beater till smooth. Let stand 30 minutes. (I personally don't bother with this letting stand 30 minutes step.) Put the bacon drippings into an 8"x8" baking pan or divided up between 6 large muffin tins. Heat in oven, make sure you watch pan as it will start to smoke! Pour batter into hot pan; bake in hot oven till done. The trick is the hot fat and the hot oven. Do not keep opening the oven to check. Serve immediately as it will deflate as it gets cold. Pour nice beef gravy over top. Or you can use "Yorkies" with chicken. Thanks to Ladylumps for sharing this recipe. This tastes so good! Every time I make a roast I try to make this.